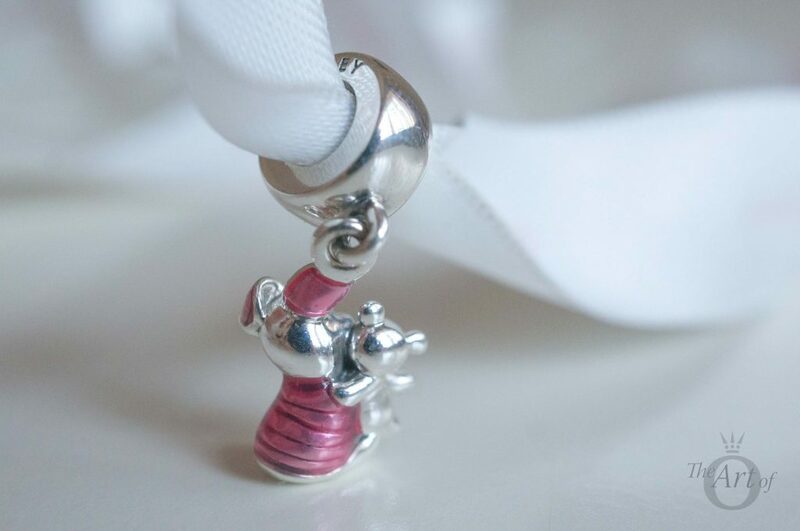 Piglet, the essence of love and loyalty, is depicted delightfully in this Dangle Charm. When I first heard that a PANDORA Piglet charm would be released in the PANDORA Disney Spring 2017 Collection, I knew I would have to add him to my collection! 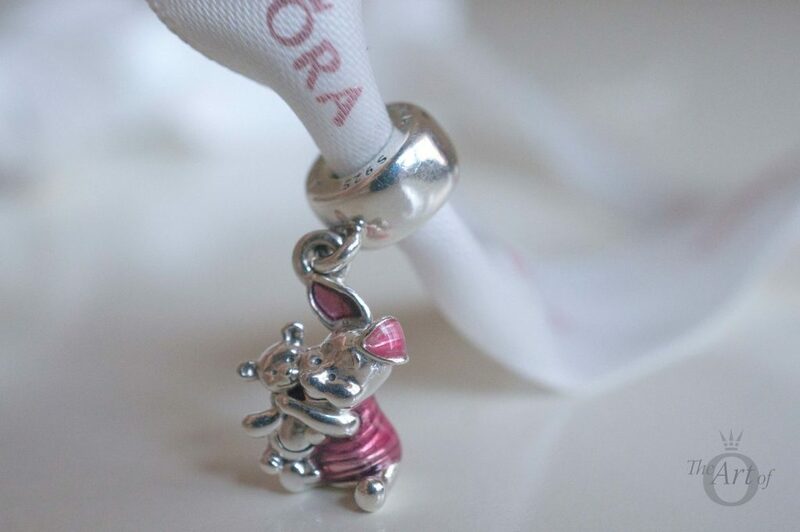 The PANDORA Disney Piglet Charm (No. 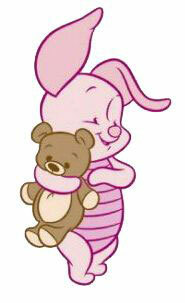 792134EN117) portrays Piglet with a beaming smile and holding a little teddy bear. Piglet was originally illustrated for the A A Milne Winnie-the-Pooh stories by artist E H Shepard. In Shepard’s illustrations Piglet is very small, has long, flappy ears and wears a green jumper. 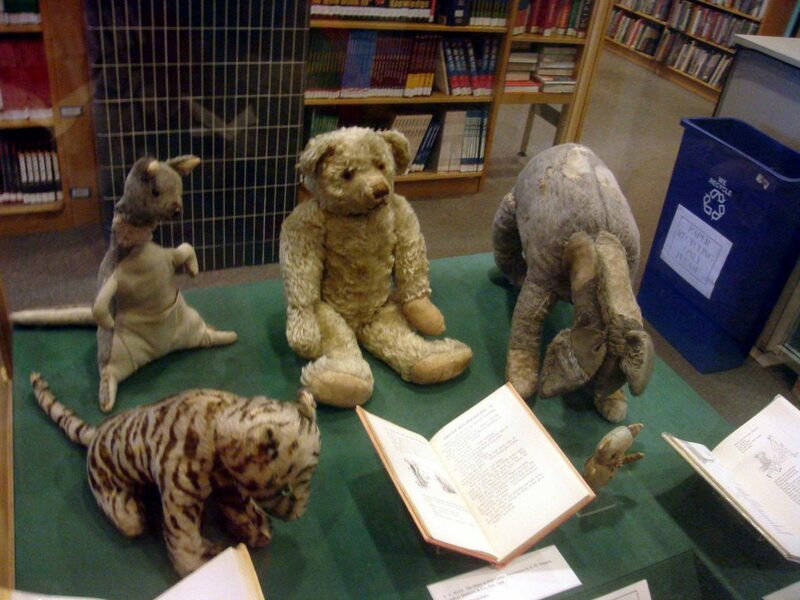 The illustrations by E H Shepard were based on the actual stuffed toys owned by Christopher Robin which featured in the Winnie-the-Pooh stories. You can see how small Piglet is (front right of picture) compared to Pooh, Eeyore, Kanga and Tigger. Interestingly Piglet was originally omitted by Disney in the first Pooh film, Winnie the Pooh and the Honey Tree (1966). Piglet was replaced by Gopher, which was thought to have a more “folksy, all-American, grass-roots image”. Thankfully, many fans of the classic Milne books protested Disney’s decision to exclude Piglet. Disney relented and Piglet appeared in the next Pooh film, Winnie the Pooh and the Blustery Day (1968). 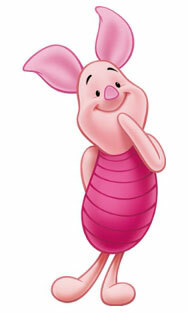 The Disney interpretation of Piglet is very similar to E H Shepard’s illustrations. The only real difference is in the Disney version Piglet is depicted wearing a pink jumper rather than the original green. In the Disney version, Piglet has a shorter, more pig-like snout instead of the long pointy nose in Shepard’s drawings. 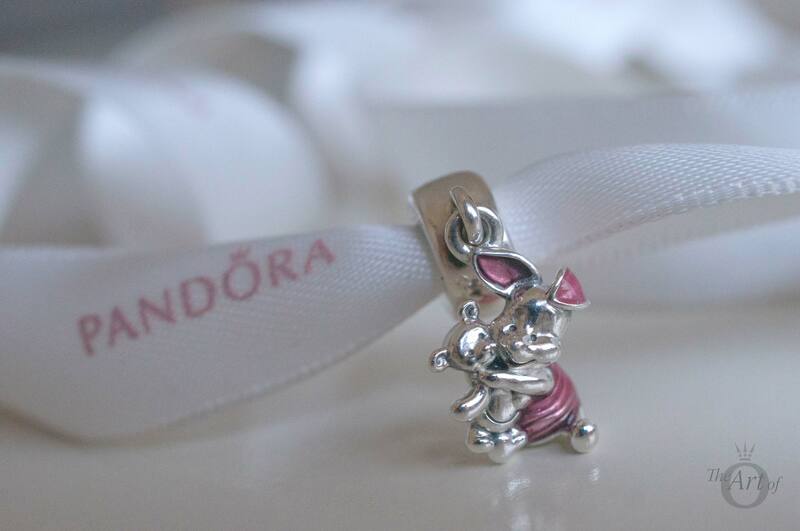 In the PANDORA Disney Piglet Charm, Piglet is holding a Teddy Bear. I have desperately tried to find out when Piglet acquires a Teddy Bear as he is never mentioned with one in the original stories. As Piglet is quite small, the little Teddy Bear adds a bit more weight and substance to the charm. 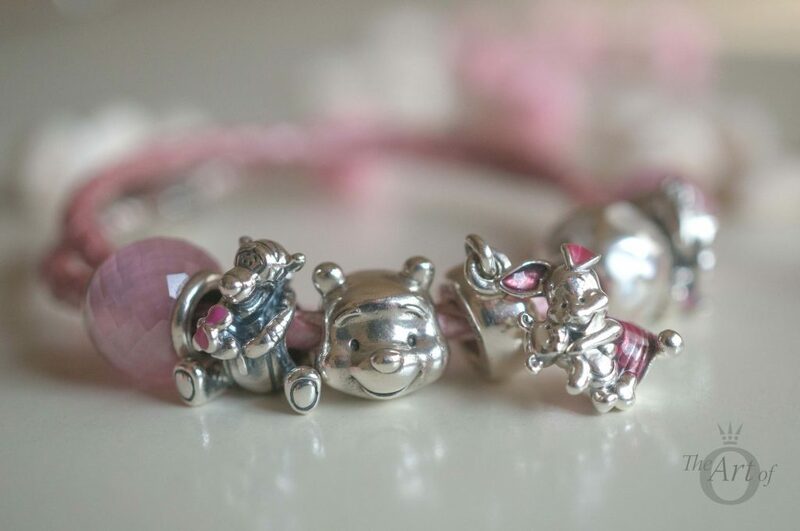 The PANDORA Disney Tigger Charm and the PANDORA Disney Piglet Charm both have pink enamel details. 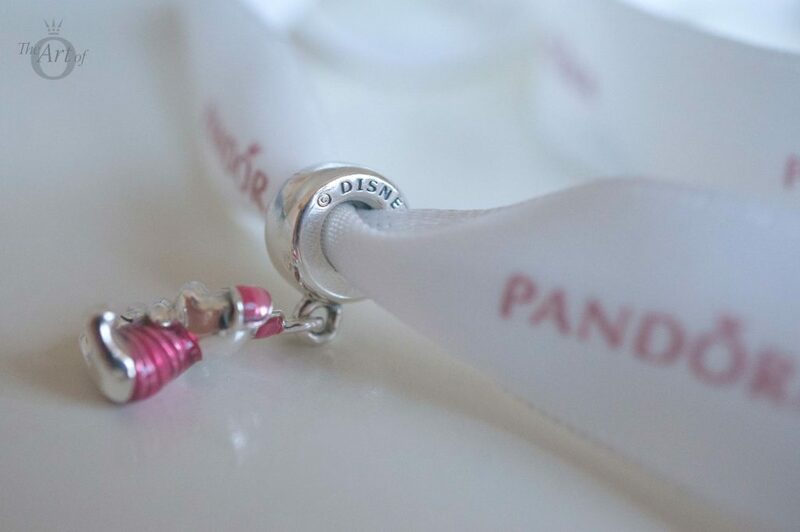 The Pink flower on the PANDORA Disney Tigger Charm is a bright fuchsia pink whereas Piglet’s ears and jumper are a translucent pink and have a softer look. 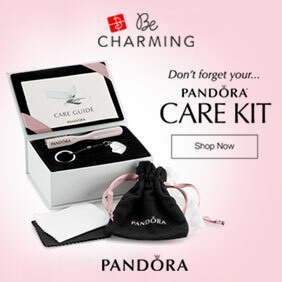 Ideally, I would have preferred a threaded charm Piglet charm, like the Tigger and Eeyore PANDORA charms. 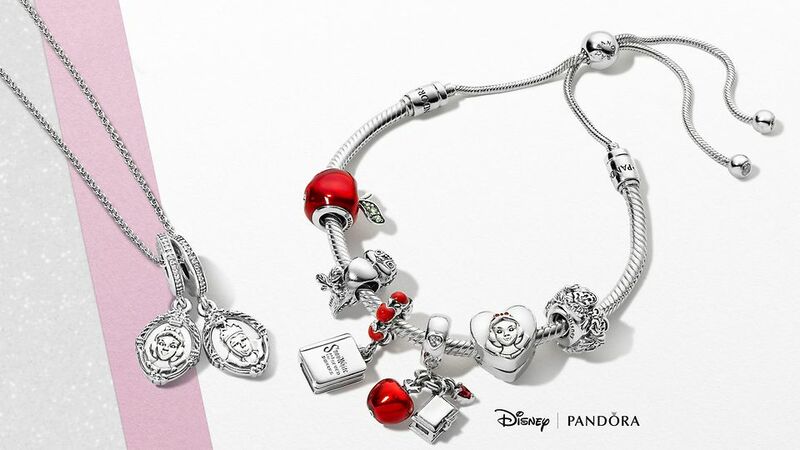 I presume that PANDORA wanted to keep some the scale to the Winnie-the-Pooh characters, which is why they created Piglet as a Dangle Charm. He really is very small and the addition of his Teddy Bear helps to give his little body more mass. 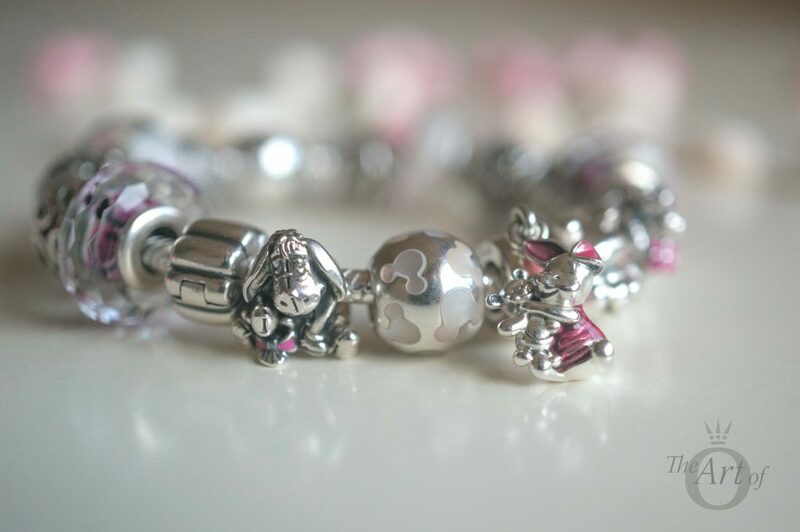 The back of the PANDORA Disney Piglet Charm is quite simple, with the main detail being the lines in Piglet’s pink jumper. 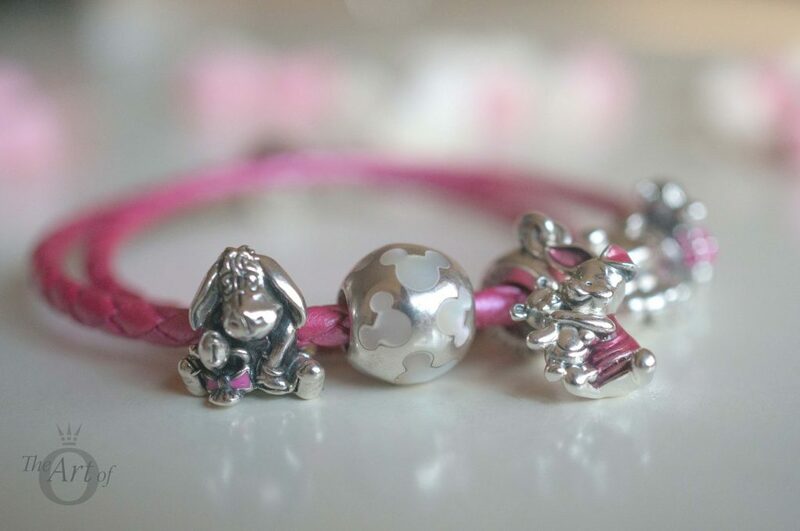 As you can see in this image the PANDORA Disney Piglet Charm is flat and almost looks two dimensional. 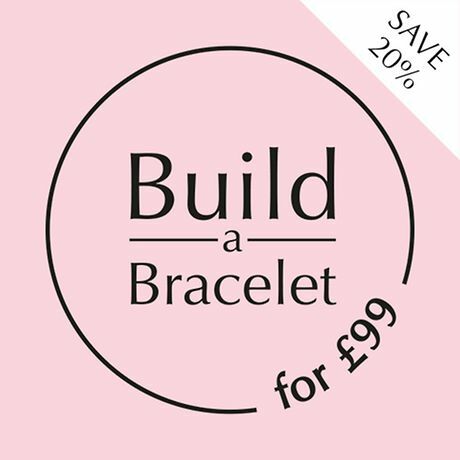 However, the lack of depth isn’t necessary a bad thing, as it helps Piglet to sit nicely against your wrist or neck. 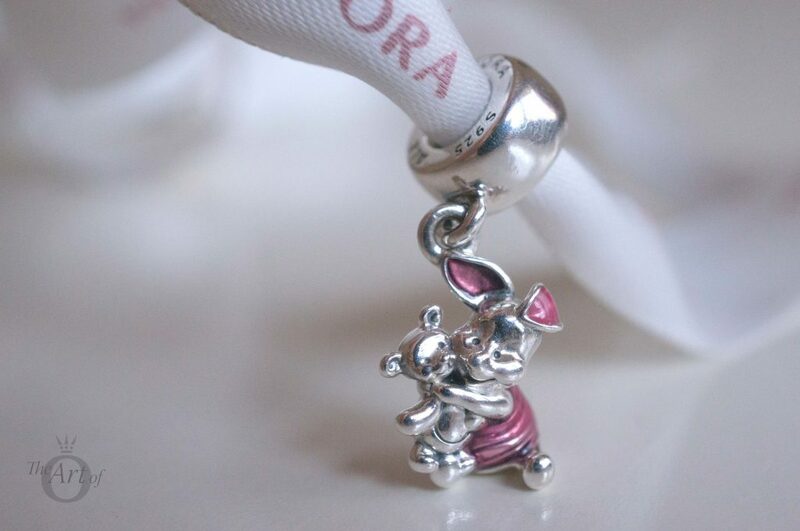 As on the PANDORA Disney Eeyore and Tigger Charms, the PANDORA Disney Piglet Charm is beautifully detailed. Both Piglet and his Teddy Bear have lovely cheeky smiles. I particularly love how Piglet’s eyebrows are raised, almost as if he in poised in anticipation of his next adventure with his best friend Pooh. 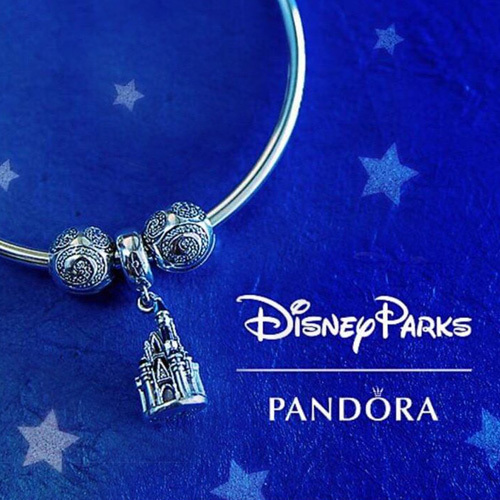 The PANDORA and Disney Hallmarks are engraved either side of the Dangle Charm’s Bale. I’m really pleased about this, as they would have looked ridiculous on Piglet’s tiny body! 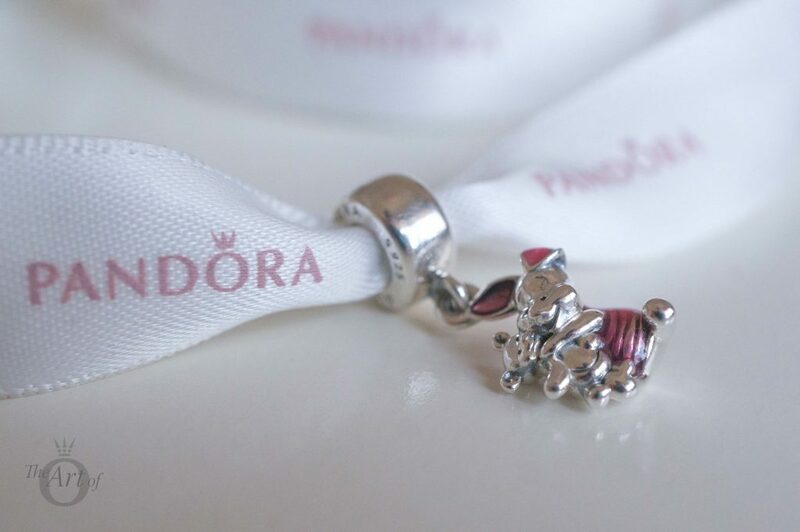 I am a little disappointed that the bale on the PANDORA Disney Piglet Charm is a plain silver. I think it would have been cute if PANDORA had added a little detail on the bale, such as Piglet’s signature. 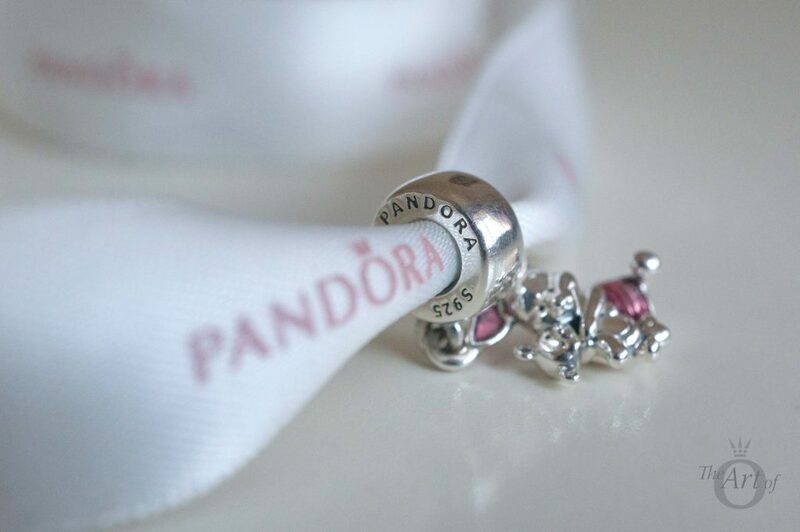 The PANDORA Disney Princess Dress Charms have their names engraved on the bale and it is a nice touch. Piglet is quite clever and can read and write, at least well enough for short notes. 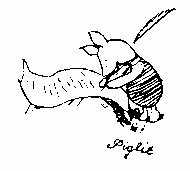 In illustrations for The House at Pooh Corner, Piglet spells his own name “Piglit”, although it is rendered as “Piglet” in the actual text even when describing his signature. 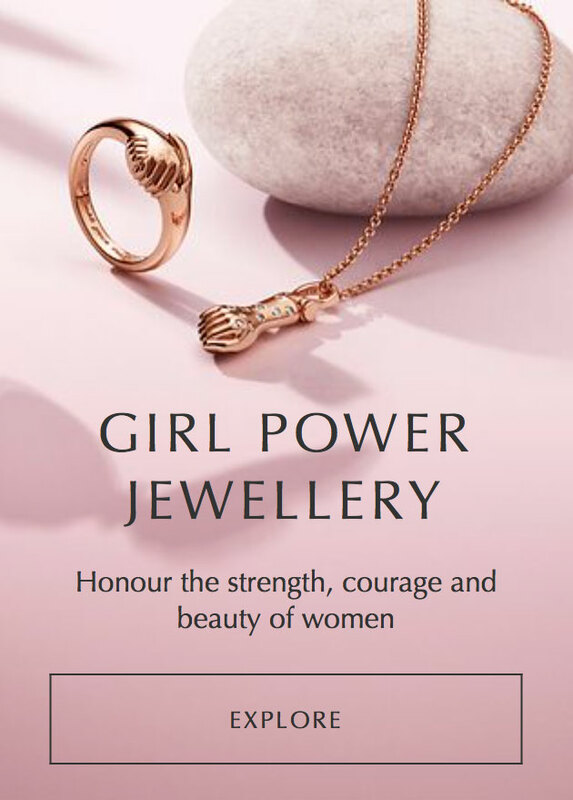 For regular readers, you will notice that in this review almost all the stylings are the same as in the PANDORA Disney Tigger Charm Review, as I will mostly be wearing the Winnie-the-Pooh characters together. 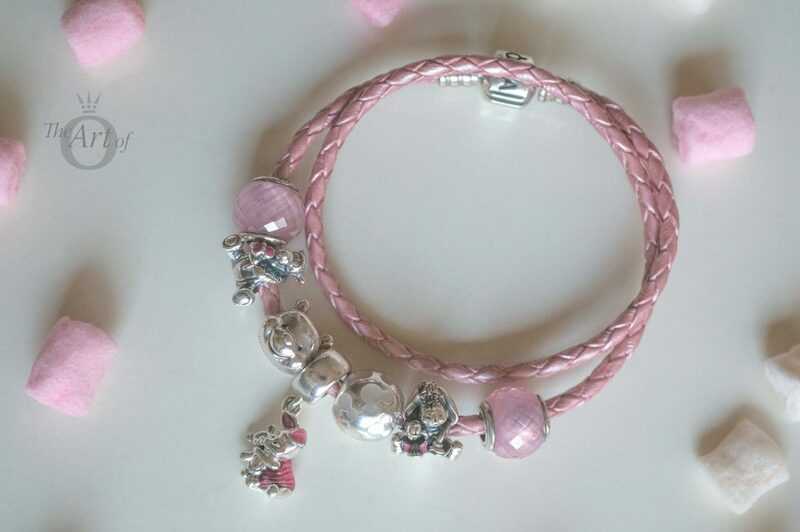 I have added additional images of the PANDORA Disney Piglet Charm in each styling so you can see how the size compares to the other charms. 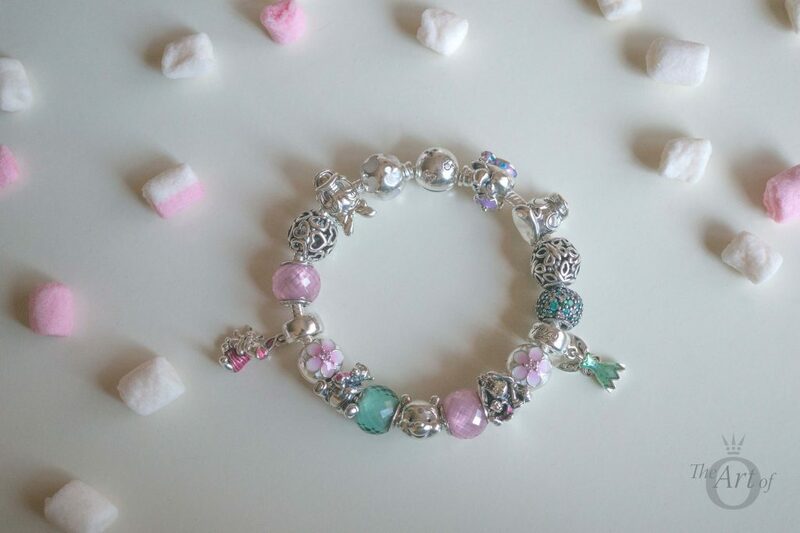 As I bought quite a few PANDORA Disney charms from the PANDORA Disney Spring 2017 Collection, I decided to created a Pink and Green Disney theme, perfect for Springtime. The Magnolia Bloom Clips provide the Spring element and the Disney Characters add fun and flavour! As well as the Winnie-the-Pooh characters: Piglet, Tigger, Pooh and Eeyore, you will also notice Donald and Daisy Duck, Mrs Potts & Chip and Tinker Bell’s Dress. 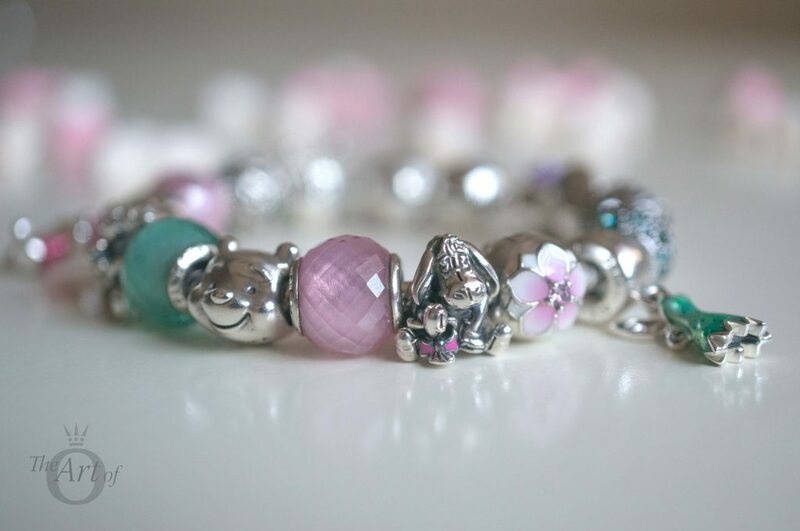 I tend to make most of my PANDORA designs symmetrical and in this design used the PANDORA Disney Piglet Charm in the centre as a feature, with Eeyore and the PANDORA Disney Tigger Charm at either side. I also used the Pearlescent Mickey Silhouettes Charm (No. 791818mop) to create balance with the Pooh Portrait Charm (No. 791566). The Shoreline Sea Glass Murano Charms (No. 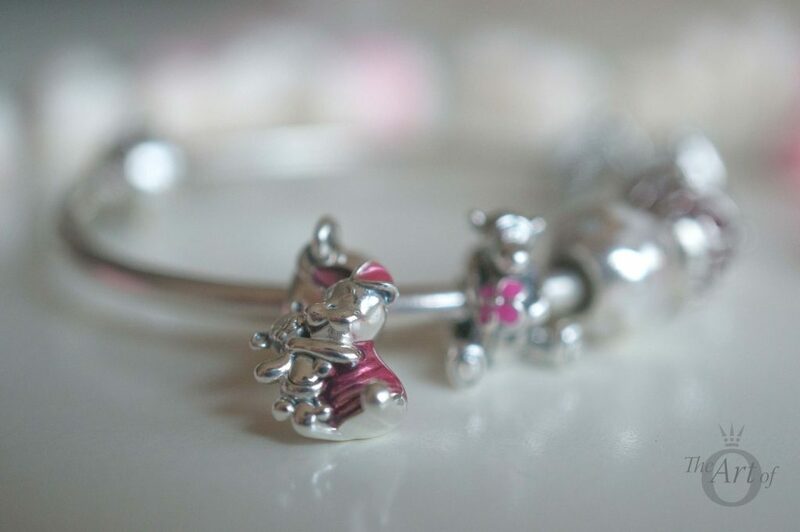 791608) pink and purple hues compliment the pink enamel on the PANDORA Disney Piglet Charm. The Sea Glass Murano Charms are so versatile and I use them in lots of my designs. 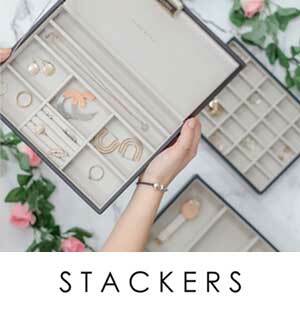 If you don’t already have them in your collection they are still available to buy from BeCharming.com. It is hard to be brave when you're only a Very Small Animal. 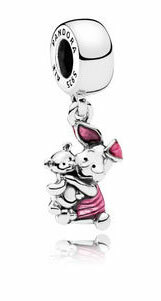 In my third styling I balanced the PANDORA Disney Piglet Charm with the Orchid Pendant. The Cerise Encased in Love Charm in the middle of the design, creates harmony with the two Pendant Charms. I really love this style as it is bright and fun yet quite simple and easy to wear. Perfect for summer! 'We'll be Friends Forever, won't we, Pooh?' asked Piglet. 'Even longer,' Pooh answered. I love wearing the PANDORA Leather Bracelets for when I want a more relaxed look. They are great for the warming months in Spring and Summer too, as they are lighter than the Silver Moments Bracelets. I used the Pink Double Leather Bracelet (No. 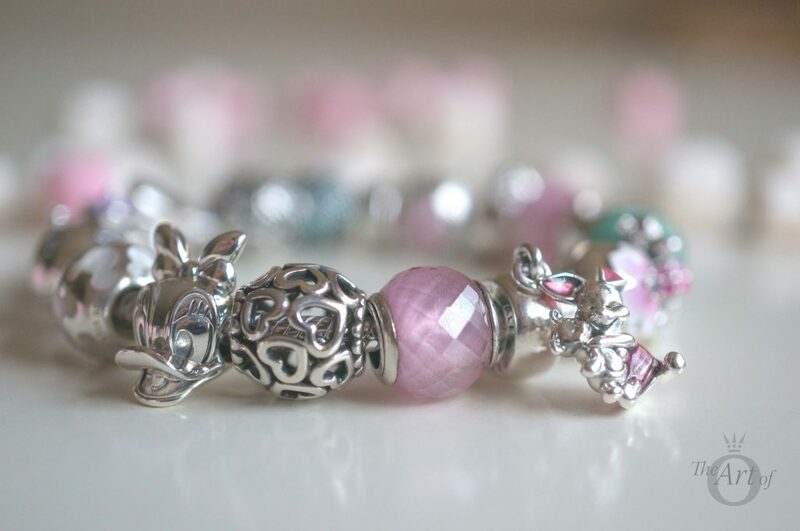 590705cmp-d) with the PANDORA Disney Piglet Charm for a softer look. 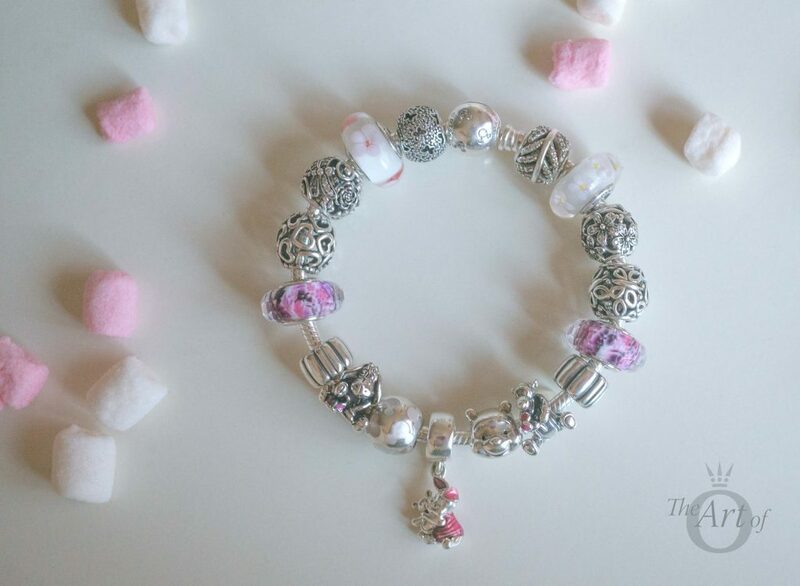 The Pink Petite Facets and the pearly shimmer of the Pearlescent Mickey Silhouettes Charm make this a sugar-sweet, delicious design. I think it expresses Piglets loving and endearing personality quite nicely. 'Supposing a tree fell down, Pooh, when we were underneath it?' 'Supposing it didn't,' said Pooh after careful thought. Piglet was comforted by this. I used the Honeysuckle Pink Double Leather Bracelet (No. 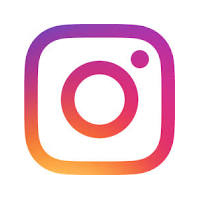 590734chp-d) to create a more vivid style. 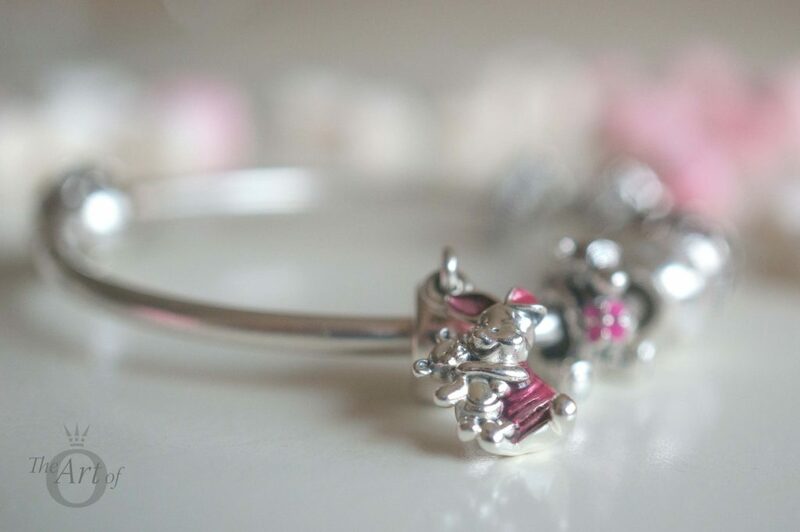 The Honeysuckle Pink enhances the pink enamel on the PANDORA Disney Piglet Charm. 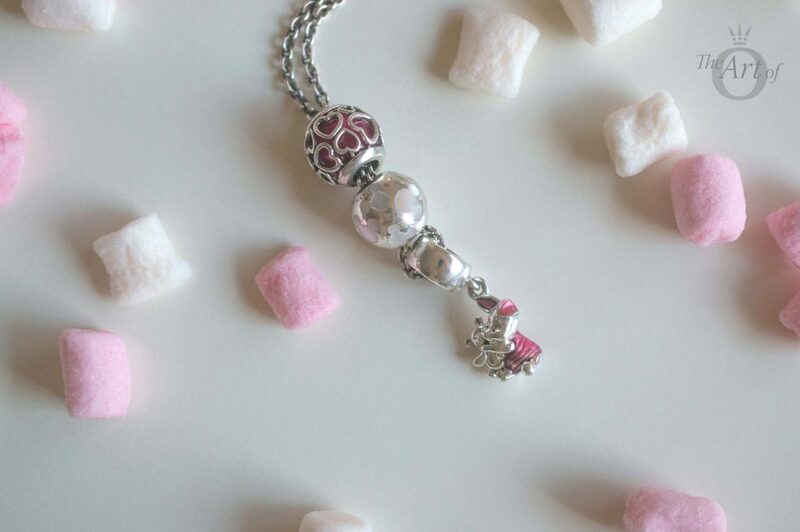 As the PANDORA Disney Piglet Charm is a Dangle Charm, it works well worn as a necklace pendant. I used the Cerise Encased in Love Charm with the Pearlescent Mickey Silhouettes Charm for a simple necklace design. I love how the pink shimmer from the mother of pearl ties in with the pink glossy enamel on Piglet. 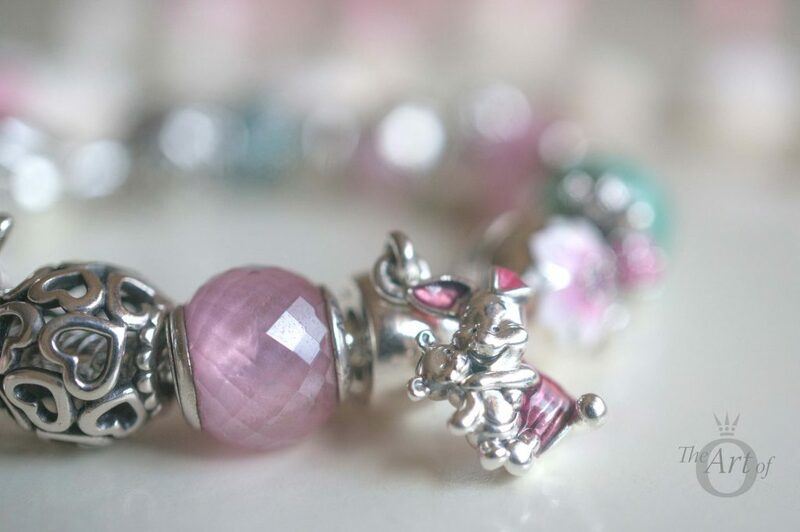 The PANDORA Disney Piglet Charm (N0. 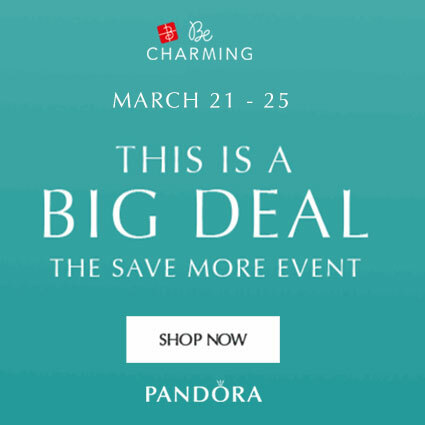 792134EN117) is $60 and is available from our preferred retailer BeCharming.com along with the rest of the PANDORA Disney 2017 Spring Collection. 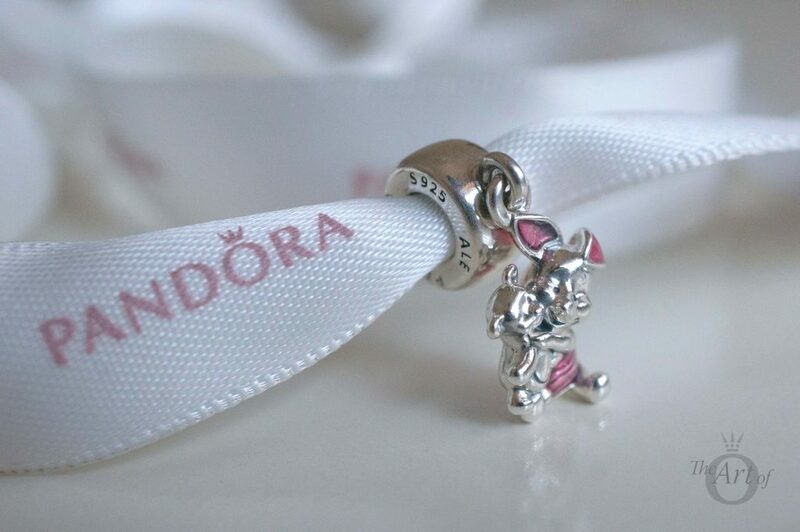 Do you have the the PANDORA Disney Piglet Charm or is it on your wishlist? Let us know how you style him in the comments below. What a beautiful review! 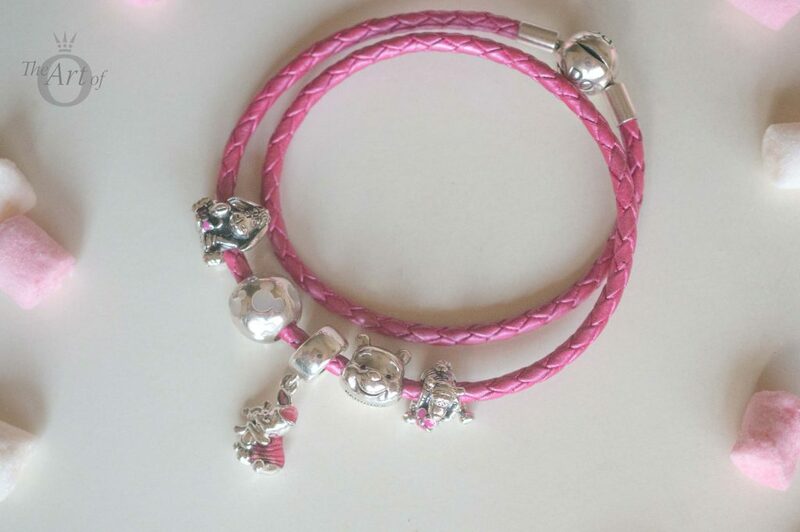 Your photos and stylings of the Piglet charm are fantastic! Thank you! 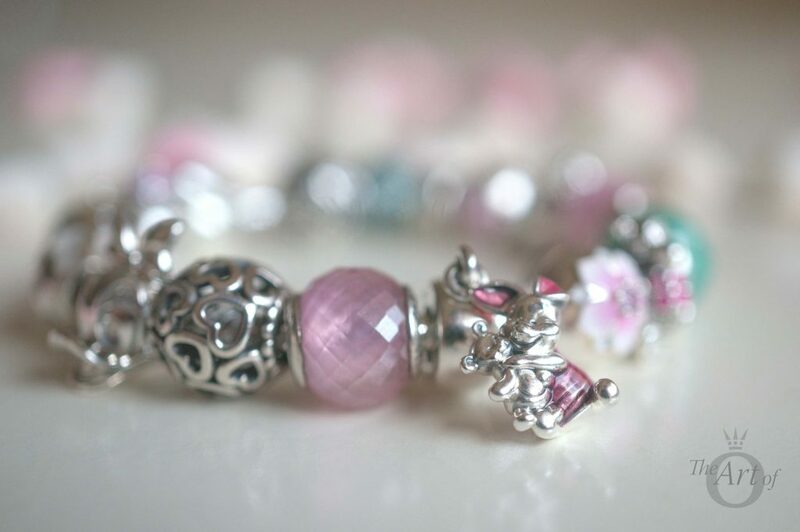 I really enjoyed reviewing the Piglet charm, it is so cute and full of detail. Look out for more stylings on #WinnieThePoohWednesday! 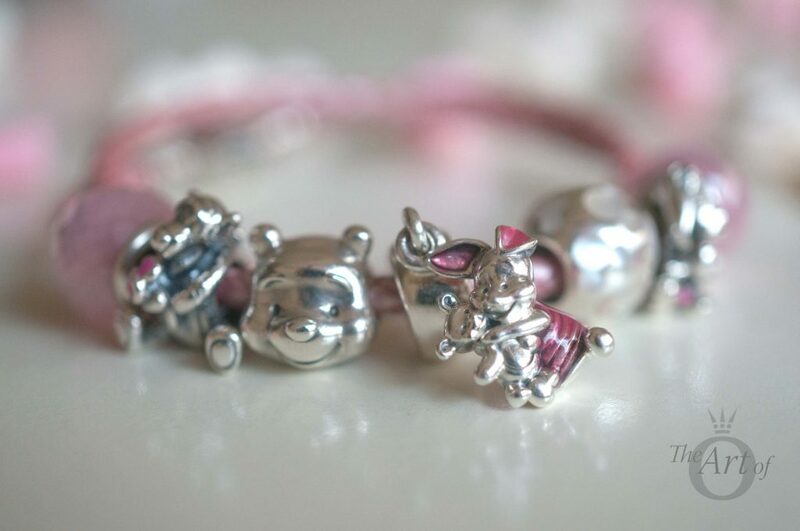 Oh the piglet charm is just so cute!! The charm is very much detailed as well. 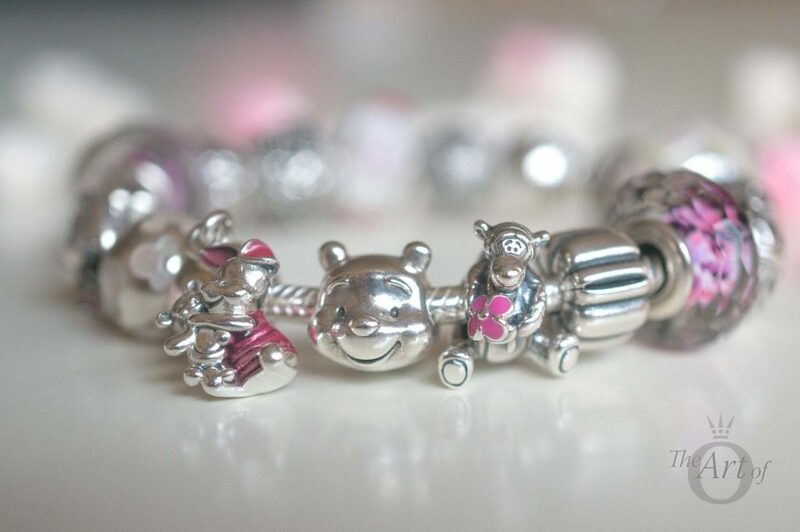 Piglet holding a cute teddy bear….I love the way you have styled your bracelet as well using the Piglet charm. It really goes well with a pink themed bracelet. wonderful. He really is very cute! I still don’t know where the teddy bear came from. Maybe it is in one of the new movies. It’s a nice little detail though.